Decisions, decisions... choosing how you will travel to your school prom is important. Your class mates will want to know in advance whilst others will be watching out for your arrival. Luckily, help is at hand with Hire Limo Leicester we can offer you the opportunity to hire impressive limos or luxury cars. You could travel and arrive in a Rolls Royce Phantom, Bentley Flying Spur, Super stretch Hummer or a (C300) Baby Bentley. If you book with your friends it will keep your price down and discover this luxury experience can be had on a realistic budget. Your prom night is the evening you will look forward to for months. Let our professional chauffeurs make you feel like you are centre of attention. They will cruise you around town in your hired vehicle prior to dropping your off at your prom venue. It will add some luxury and excitement to your exciting evening. Our dedicated and experienced chauffeurs will do everything in our power to ensure you arrive to your prom on time and in style and ready to party. What's more each of our vehicles contains superb entertainment systems and complementary bar of soft drinks. So all you have to think about is having amazing time and lots of fun. The limo journey itself is spectacular; once you sit inside one of our vehicles you will experience unrivalled service, state of the art entertainment system and lots of enjoyment. It s a great way to start your prom night, you will be able to have your own private mobile party as you use the DVD player, CD player, disco lighting system and flat screen television. You could bring your own CD collection. Our vehicles have great sound systems and interior lighting - you will think you are already at the prom or in a moving nightclub. 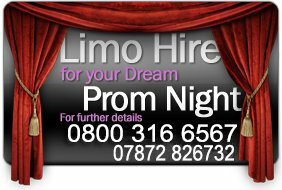 So call today and let us make your prom night a night to remember by hiring a luxury vehicle for your school prom night. 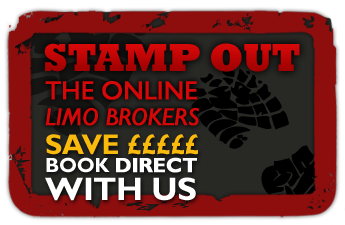 We offer our services throughout the Midlands especially Leicester, Nottingham, Derby, Grantham, Newark, Birmingham and many other towns or cities in the Midlands region.